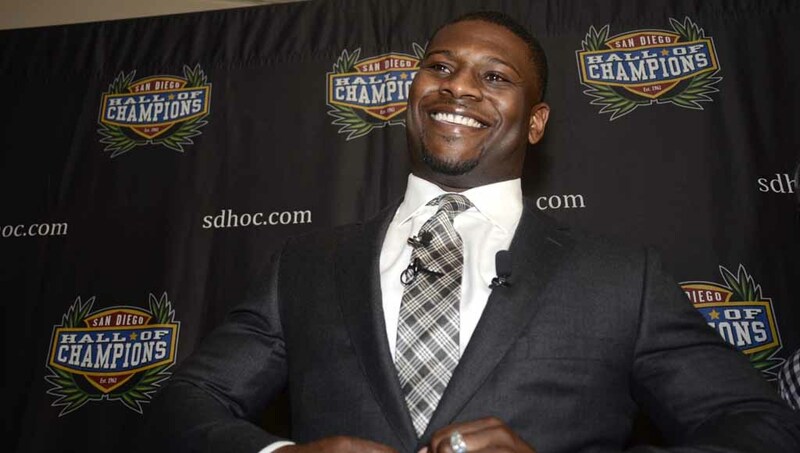 Former Charger running back LaDanian Tomlinson and Lincoln High School standout Terrell Davis were selected to the Pro Football Hall of Fame Saturday. Two other finalists with San Diego connections — one player and one coach — were not. The announcement of who will be enshrined was part of activities leading up to Sunday’s Super Bowl in Houston between the Atlanta Falcons and New England Patriots. Tomlinson ranks fifth in National Football League history with 13,684 yards rushing, seventh in all-purpose yards with 18,456 and third in touchdowns with 162. It was his first time on the list. Ex-Denver Broncos running back Terrell Davis, who played at Lincoln High School, won the Super Bowl twice and was the league’s Most Valuable Player once across four spectacular seasons. He played at Long Beach State after graduating high school, before moving on to the University of Georgia. The two who were not selected from San Diego included former Broncos and Tampa Bay Buccaneers safety John Lynch, from Torrey Pines High School. He is a nine-time Pro Bowl participant in 15 seasons who was recently hired as general manager of the San Francisco 49ers. Don Coryell also was not selected. He was a head coach who brought an unprecedented aerial attack to the then-St. Louis Cardinals and later the Chargers, compiling a 111-83-1 record in 14 seasons, with six playoff appearances. Coryell, a member of the College Football Hall of Fame for developing the I-formation system at USC and passing game at San Diego State University, died in 2010. Some of the current members of the Hall of Fame with San Diego connections are ex-Chargers receiver Lance Alworth; Marcus Allen, the Raiders running back who starred at Lincoln High; Rams and Colts running back Marshall Faulk, who played at San Diego State; and Junior Seau, the late Chargers linebacker who grew up in Oceanside and played his college football at USC.